It was a wonderful night of music and good friends! I love the variety and surprises of the evening in such beautiful atmosphere! This is a music video of Them There Eyes, originally sung by Billie Holiday. 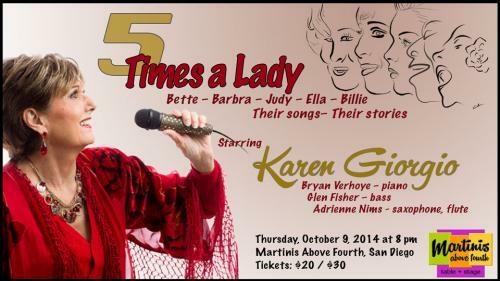 This song is sung live in Karen's cabaret show, "5 Times A Lady" at Martinis Above Fourth Table + Stage in San Diego, CA. The DVD of the entire show is for sale here in my store.